Boe Horton, VP of ProQuest Sales-Asia Pacific, along with Alan Lui, Executive Director of China Business Development, presented research on library users’ behavior among faculty, librarians, and students in Chinese universities to nearly 500 librarians at the CALIS (China Academic Library and Information System) annual conference on May 13, 2014, in Harbin, China. Mr. Horton showed his fluent Mandarin in his opening remarks, and brought the house down. 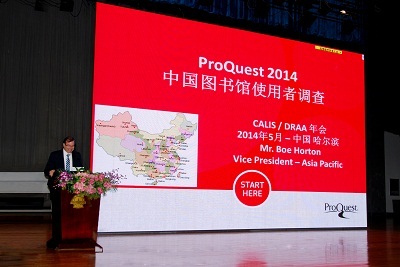 The presentation summarized the survey result from 2,049 respondents in 318 Chinese institutions, conducted by ProQuest with CALIS this April. The survey analyzed ways to obtain the information, the formats they read, as well as the devices/apps they prefer to use. The survey results concluded that "digital resources are more appreciated than print resources, for being more portable, accessible and searchable. This is especially appealing for faculty, as compared to students." Finally, he presented the solutions ProQuest can provide to help users research better and improve outcomes. The leader of CALIS – Professor Zhu Qiang of Peking University – mentioned some of the key findings of the study during his opening remarks at the start of the conference as well. 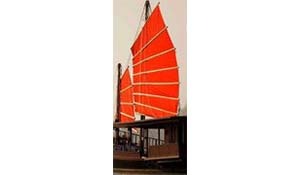 CALIS is a nationwide academic library consortium, funded primarily by the Chinese government, under the leadership of the Ministry of Education. Its goal is to promote, maintain and improve library resource sharing among Chinese universities, between academic libraries, and among other libraries and information institutions. Read about the rest of the survey findings here.